A spicy flavorful version of chili. This White Chili gives a slight kick, but it’s big on taste! 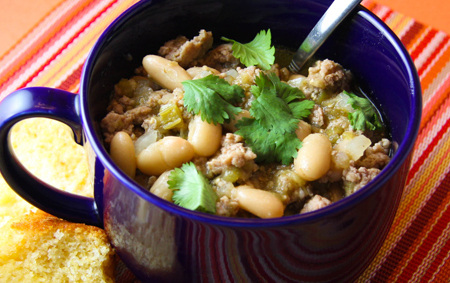 Hearty cannellini beans, ground turkey and fresh cilantro mixed in give you a filling meal. Inhale and say YUM!! Last Friday between the hours of 4:00 p.m. and 6:15 p.m., I was a wee bit stressed. A snow storm rolled into the city just as gobs of people headed home from work for the weekend. It took me an hour and fifteen minutes to pick the boys up from daycare and get home. This is something that usually takes me 25 minutes or less. My husband was out of town for the night. The roads were terrible. I had snow in my shoes. The heater in my car was not working. Sam was extra fussy due to a missed feeding. Once at home, he had to be in my arms or else he was wailing to the point of making my ears bleed. I wanted peace and warmth and sanity. Putting on dry socks and getting Sammy fed and put to bed helped. A friend was able to find her way to our house in spite of the storm, thank goodness, because this is just what I needed. An evening with a girlfriend. And chili. We prepared this most delicious recipe as we chatted about the week. It was nice. The chili rocked. I could not have asked for a better snowy evening. Chili with a slight kick, but big taste! Inhale and say YUM!! In a large skillet or saucepan, heat olive oil on medium-high heat. Add turkey and cook through until meat is no longer pink. Transfer cooked turkey to a bowl, leaving juices in pan. 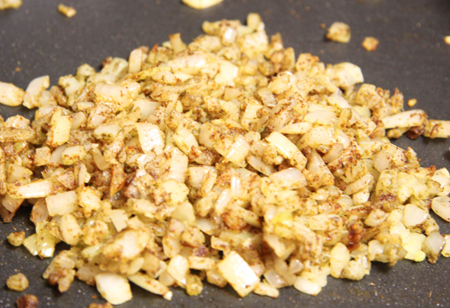 Add onion and garlic to skillet and cook on medium for 5 minutes. Add cumin, oregano, cinnamon and cayenne pepper. Cook and stir for 1 minute. Add salsa, beans, broth and cooked turkey. Heat to boiling on high. Reduce heat to medium. Cover and cook 15 minutes. Garnish with cilantro.